Women have taken driving a car for granted for many years but it is easy to forget that in the early days of motoring in Great Britain it was regarded as a hazardous undertaking, not suitable for a woman. As with having the right to vote and other male preserves. The background to this story is that Louis Bazalgette had two elder sons, Joseph William (who sired my branch of the family) and John. Most of John’s sons entered the army, the exception being George, who joined the Royal Marines Light Infantry. There is a lot about George at this website http://www.royalengineers.ca/Bazalgette.html though there are some inaccuracies to be found there. George is best known for commanding the British garrison on San Juan Island during its rather friendly dual occupation known as The Pig War. In June 1870 George married Louise Seville, a lady 16 years his junior. George died in 1885 and Louise outlived him by 23 years. She must have been very fond of old George, though, because before her death, finding his burial plot too small for both of them, she had him dug up and moved to a larger plot, in which she finally joined him in 1918. As a widow she may have found time on her hands, and her interest turned to the new sport of ‘automobilism’. She was enough of a novelty that there were frequent articles in motoring magazines starting in 1899 about her intrepid journeys from London to far-flung places such as Essex. 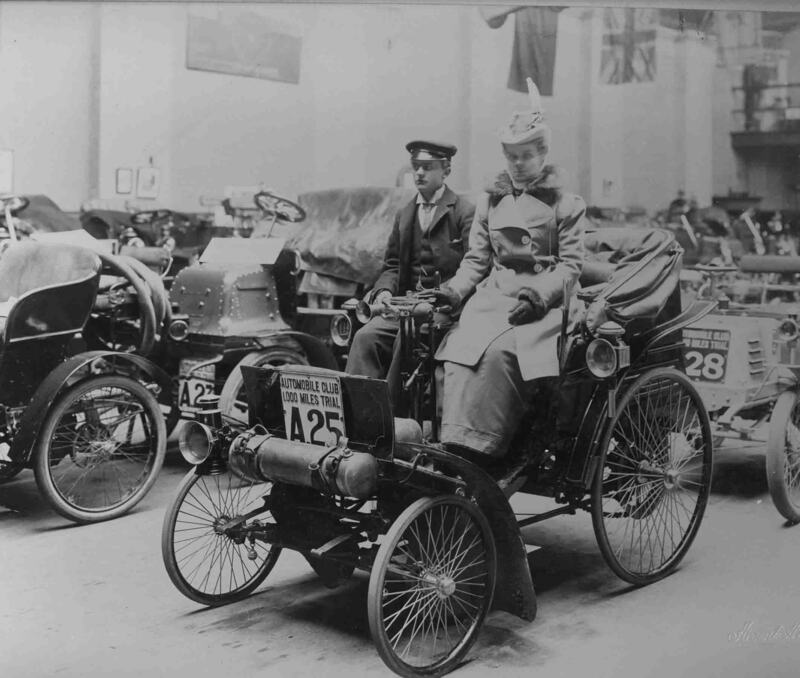 She was also one of the few female entrants to the Automobile Club’s 1,000 Mile Trial in 1900. An article in The Motor-Car Journal in September 1899 describes one such journey. An article in Louise’s own words, presumably transcribed from an address she delivered to the Automobile Club, was reported in the Motor Car Journal in November 1899. Bedford and Norwich, and I have run swiftly on the high roads and wandered through the lanes of Kent, Oxfordshire, Warwickshire, Berkshire, Buckinghamshire and Essex. It is possible to drive a car with very little knowledge of machinery, if you have a skilled mechanic with you to help in case of a breakdown; but the lady motorist is in a much more happy frame of mind during her travels if she herself possesses knowledge of the mechanism of her automobile. It is so much more enjoyable to really study and understand everything concerning the car you take an interest in. You must not imagine that it is possible for any lady to acquire sufficient knowledge of the working parts of the driving machinery in a few days, or even months, but they should have the opportunity of studying it. This is one of the main objects of the club we hope to form. She was a doughty old thing it appears. Hello, my name is Louise Bazalgette and I am also an expert lady motorist! Good to hear from you, Louise! I expect you don’t have to take along a lad to look after the vehicle though.